When you go to the grocery store to buy bread, apples, milk, eggs, cereal, cheese, spinach, etc., have you ever thought about how much of the price goes back to the farmer? Probably not. The amount might surprise you. 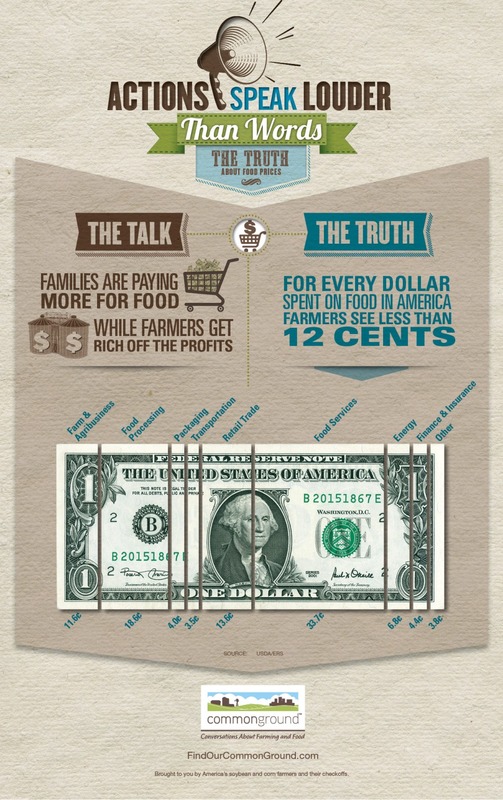 Did you know that for every dollar spent on food in America, farmers only receive 12 cents back? 12 cents! The other 88 cents goes to packaging, food processing, transportation, retail trade, food services, energy to keep goods cool, and finance and insurance. 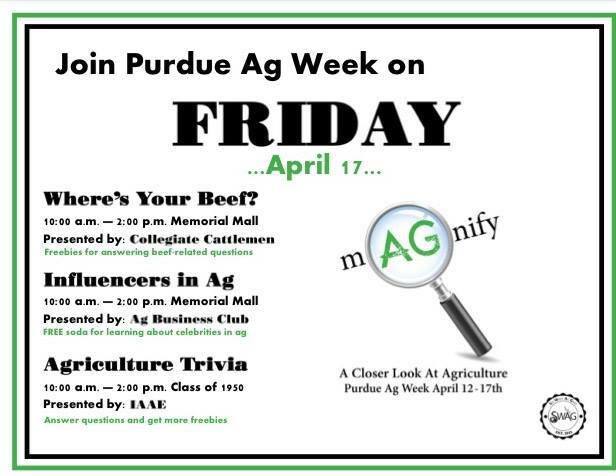 This is another misconception that Purdue Ag students are trying to bring awareness to during Purdue Ag Week. Many people think they are paying a lot for food while farmers get rich off the profits. But in reality, farmers put a lot of time, effort and resources into growing a product they don’t end up getting much financial return on. To demonstrate this, students from the Ag Communicators of Tomorrow and Collegiate 4-H are holding a Farmer’s Breakfast. During this event, students will receive a complete breakfast (that would normally cost them $2.00) for only 25 cents. This amount demonstrates how much the farmer would earn back from the cost of that meal. The fact that farmers do so much work for not much in return just shows how much passion they have for what they do. Farming is truly a lifestyle and you can’t just be in farming for the money. Because on average, you won’t make a ton. Farmers simply do it for the satisfaction of helping feed the world. So next time you see a farmer, give them a thank you for their hard work and selflessness. They deserve it. Also on Wednesday, Ag Week Task Force will be hosting 100 students for an Oxfam America Hunger Banquet where students will get a firsthand experience with the effects of global hunger and listen to a keynote address from Libby Crimmings of the World Food Prize. But this isn’t just your normal dinner banquet. 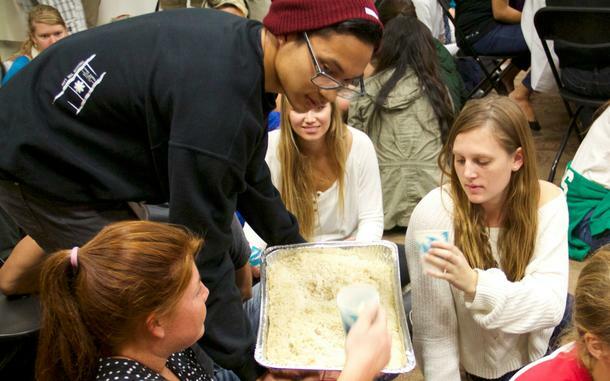 At an Oxfam America Hunger Banquet, the place where you sit, and the meal that you eat, are determined by the luck of the draw—just as in real life some of us are born into relative prosperity and others into poverty. When guests arrive, they draw tickets at random that assign each to a high-, middle-, or low-income tier—based on the latest statistics about the number of people living in poverty. Each income level receives a corresponding meal. The 20 percent in the high-income tier are served a sumptuous meal; the 30 percent in the middle-income section eat a simple meal of rice and beans; and the 50 percent in the low-income tier help themselves to small portions of rice and water. That would give you a big dose of reality, wouldn’t it? A master of ceremonies reads a script to guide participants through the interactive event. Finally, all guests are invited to share their thoughts after the meal and to take action to right the wrong of poverty. I had never heard of this experience before, but I think it is such a creative way to bring awareness to hunger and poverty. Because as with as many resources as we have in this world, hunger and poverty shouldn’t be something people should have to worry about. Ag Week is only at the half way point, and I just have to say how impressed and proud I am to see students putting together all of these excellent events to help bring awareness to the various parts of agriculture. I can’t wait to see the rest of the things they have in store! Tomorrow I will be sharing about Ag Week events for Thursday and Friday. Thursday is the ever-popular “Pet A (Goat) Kid” event, along with mini tractor pulls and various other club events. 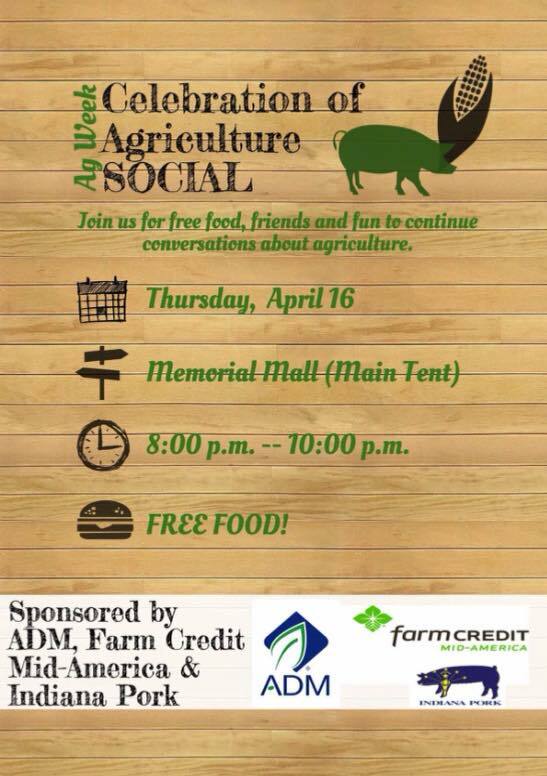 Thursday night will be a Celebration of Agriculture, a social event where students can join together in community to continue conversations about agriculture. And wrapping up the week on Friday will be three club events from the Cattleman’s Club, Ag Business Club and IAAE. Purdue Ag Week has officially begun! 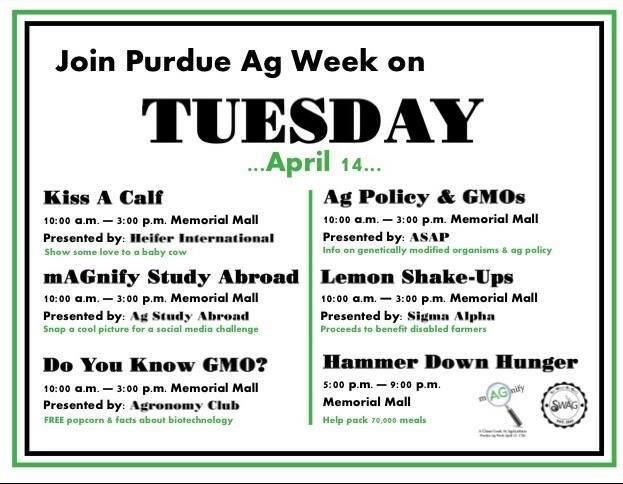 As I mentioned in my last post, Purdue Ag Week is a campus-wide initiative at Purdue University that encourages meaningful peer-to-peer conversations about agriculture. Over 25 College of Agriculture student clubs are working to inspire others to See What Ag Gives by hosting interactive events this week across campus. Purdue’s Collegiate FFA kicked off the week’s festivities with a Farmer 5K Run/Walk to raise awareness about agriculture and the unfortunate reality of food insecurity. It was a success! The event raised $720 for a new Food Finders Food Bank school pantry that will help feed school children during the summer and help battle food insecurity in the Lafayette area. Great work everyone! 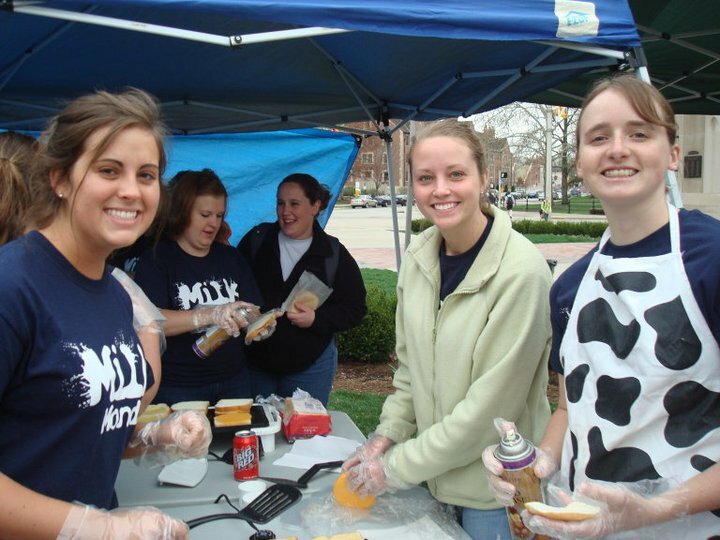 This event always holds a special place in my heart, because when I was a senior at Purdue, we (Ag Communicators of Tomorrow) partnered with the Dairy Club to hold the very first Milk Monday as part of Grand Alternative Week! It’s so great to see this tradition continue as part of Ag Week and spreading even more awareness for the dairy industry. 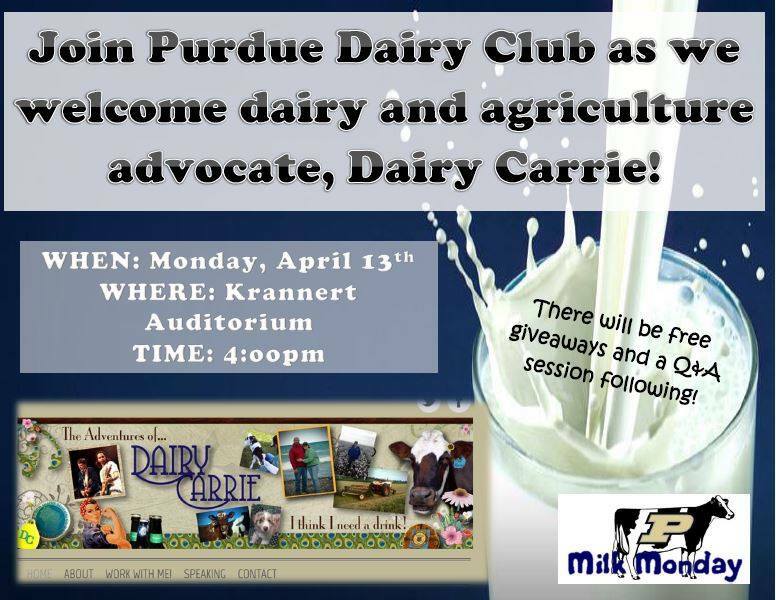 Then, keeping with the dairy theme for the day, the Dairy Club is bringing in blogger Dairy Carrie to speak at 4 p.m. in the Krannert Auditorium! If you aren’t familiar with Carrie, she and her husband farm with his parents on their 100 cow dairy farm in southern Wisconsin. She writes about agriculture and her life as a dairy farmer on her blog, The Adventures of Dairy Carrie. As part of Ag Week, Carrie will be sharing her agriculture story and giving students the chance to ask questions and learn more about what life is like on a dairy farm. And from what I know of Carrie, she’s pretty funny, so I’m sure you’ll also get a few laughs along with it. I really wish I was in town to attend this event, because Carrie is a great blogger and has wonderful life and on-farm experiences to share with everyone. If you’re going to be in town, I really encourage you to attend her session! If, not you can learn more about her by heading over to her blog or Facebook page. Another neat feature of Ag Week is their new Instagram challenge! Each day they will be having a contest on Instagram featuring a different challenge that coordinates with that day’s events. With each contest, you simply post a picture on Instagram that meets the challenge and enter by using the hashtags #mAGnifyPurdue or #mAGnifyChallenge. Monday’s Challenge – Post a photo sharing about your experience at Milk Monday! It’s only the second day of Ag Week and they already have a lot of great things happening! The events continue tomorrow with Heifer International’s Kiss a Calf, Agronomy Club and ASAP’s sessions on Ag Policy and GMOs, and the Hammer Down Hunger meal packing event. Check back tomorrow to learn more! With the majority of our population being three generations removed from the farm, knowledge of how food is grown and where it comes from is decreasing with each generation. But more recently, consumers are looking to know more about what is in their favorite foods and how they are grown. 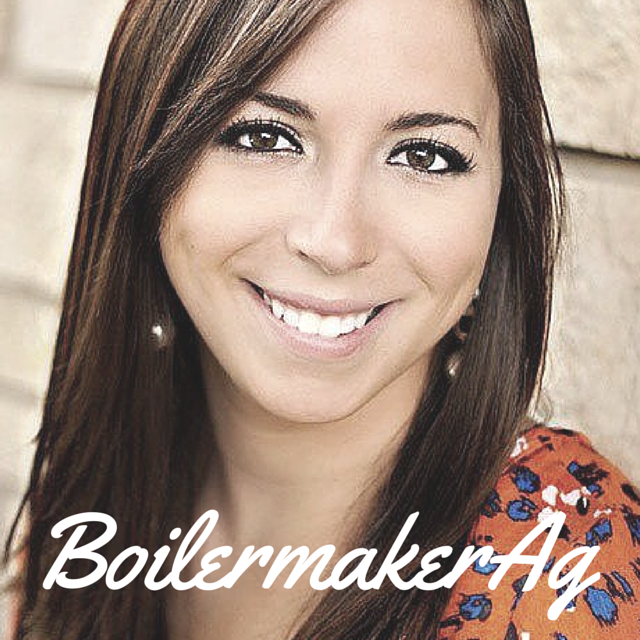 So in an effort to help increase awareness about agriculture, students from Purdue University created Purdue Ag Week. In its fourth year, Ag Week is a student-organized event that aims to show the campus of Purdue what agriculture gives. The Purdue Ag Task Force, a Purdue student organization, leads the effort and aspires to make Ag Week an event where the various facets of local, national and international agriculture are understood and celebrated. 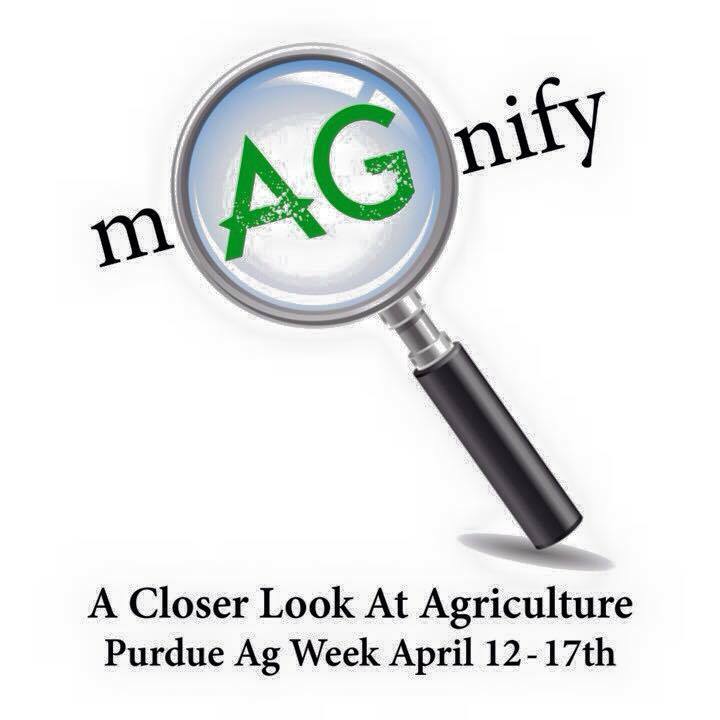 The theme of this year’s Purdue Ag Week (April 12-17) is mAGnify: A Closer Look at Agriculture. Throughout the week, more than 20 student clubs and organizations will be hosting interactive events that highlight different aspects about agriculture. The goal of these events will be to give students a closer look at how farmers, ranchers and the agricultural industry produces the food, fiber and fuel that are so vital to all of us. In addition, members at the Ag Task Force booth on Memorial Mall will be giving away t-shirts, stress balls and koozies when students take a quiz about agriculture. This year, they are having students take the quiz (which features different questions each day) on their phones to emphasize technology and better record the scores. Once students are done with the quiz, Ag Task Force members will discuss the answers with them and share additional facts about agriculture. I realize many of you might not be able to physically attend if you are in different parts of the state or country, but I still wanted to help spread the word about this awesome event and pass along the important facts being shared at the various events. This week, I will be publishing a series of posts highlighting the various Ag Week events that will be taking place. Be sure to check back to see all of the things they have in store! Kicking off this year’s Ag Week will be Collegiate FFA’s Farmer 5K! In this farmer-themed run/walk, students are inviting runners to grab their bibs, flannel, and other farm gear to raise money for the Food Finders Twin Lakes Student Food Pantry. This race is aimed at raising awareness of the agricultural industry and supporting efforts to help end food insecurity. Did you know that one in six Americans experience hunger or food insecurity? This combined with the fact that farmers will have to produce an estimated 70% more food by 2050 in order to meet the rising world population demand is alarming. During the 5K, runners will blaze past agriculture facts as they complete the course, learning about different food, farms, and farmers around every turn. 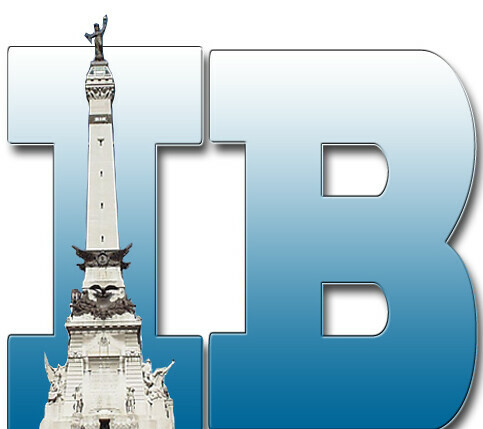 The race begins at 9:30 a.m., with on-site registration and packet pick-up taking place from 8:00am to 30 minutes before the race at the Purdue Engineering Fountain. All runners and walkers must be registered. If you’re interested in participating, or even just watching, you can find all the details on their Farmer 5K website. 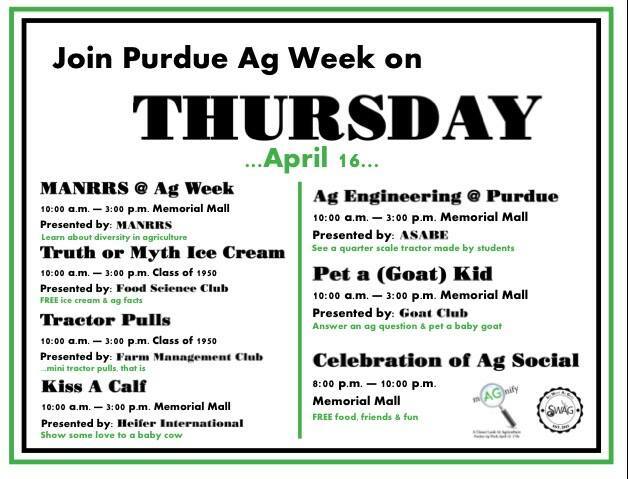 Ag week continues on Monday April 13 with the Purdue Dairy Club’s Milk Monday event and a presentation by dairy farmer and blogger, Dairy Carrie! Check back tomorrow to learn more about these fun and exciting events. Also, don’t forget to follow along on social media by using the hashtag #mAGnifyPurdue and following @PurdueAgWeek on Facebook, Twitter, and Instagram.